It’s the first of May! Which means that a new month presents the chance for a new start. If April wasn’t the month for you, lets own it in May! This month I am working hard on my diet, aiming to attend all 13 of my bootcamp classes, partaking in the Tone It Up Bikini Series and completing both the 30 Day Squat and Abs challenges. Anyways onto this weeks workout! This week is another challenge video brought to you by the ever so cheerful Casey Ho from Blogilates. Similar to the Call Me Maybe Squat Challenge I posted about the other week, this video requires you to complete one move in various forms for around 3 minutes. The video targets the inner thigh which I know may of you like to know how to tone, so here’s a video to show you how. As the video targets the inner thigh, this obviously brings up the subject of the thigh gap. If you are unsure of what a thigh gap is, it is a small, hollow cavity with a huge following on social media. Basically if you can stand straight with your knees together and see a space between your upper thighs, you have what thousands of young girls are willing to starve themselves for. Now I’m unsure as to whether this elusive goal is something that people of my age (mid twenties) aim for or whether it is just a teenage fascination. But the picture above demonstrates perfectly that a thigh gap is only achievable for around half of the population; those with wide hips. 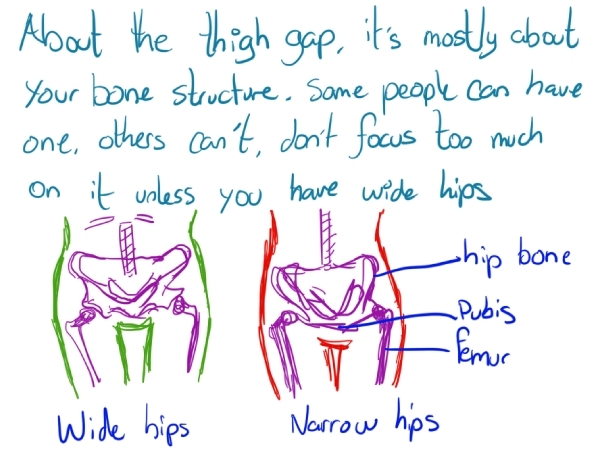 Now unfortunately I do not have a measurement on how to know whether you have wide or narrow hips, but I know that personally a thigh gap is not something I aim for. Yes I want to tone my inner thighs. But I know that when I was at my lowest weight I never had a thigh gap. To be honest I was never aware of this obsession with thigh gaps until I joined tumblr and found hundreds of pictures of waif like girls with gaps between their thighs and the sheer obsession and longing for this gap by other girls. Many of the images are of girls who have clearly starved themselves to reach this thigh gap goal, which is sad. If you Google thigh gap it is synonymous with eating disorders which shows that it’s not a healthy aim for many. Obviously a thigh gap can be achieved by some through healthy eating and exercise, so if you naturally have a thigh gap or have gained it through a healthy lifestyle then great. As always it goes back to my personal beliefs that girls should aim to be strong and toned not skinny and waif like. Please do enjoy the video I posted above, but please also remember that a thigh gap may be an unrealistic goal for you. Listen and learn about your own body, do not aim for a body that someone else has. You can only ever be the best version of yourself, not someone else. If you naturally have a thigh gap, then good for you, if you have a thigh gap from healthy eating and exercise then good for you, if you don’t have a thigh gap, then good for you. The thigh gap is attainable by some, but not a realistic goal for everyone. You can only do your best to tone the area, so play the video and lets get some toned thighs. What are your health and fitness goals for May? Write them down and make yourself accountable Let me know if you enjoy the video, or if you have any thoughts on the nations obsession with the thigh gap? That's interesting to know. I didn't mean to offend yourself or anyone, so apologies if you are. But my personal beliefs are that healthy=happy. If you eat well and exercise then you will be happier than someone who starves themselves for the same result. To me toned bodies that are created through diet and exercise are more attractive than those who that are all skin and bones. But that's through my life experiences and eyes. Others think differently which I understand and appreciate. Everyone is entitled to their opinions. All I ever want is for my readers to be healthy and happy and not to put pressure on themselves. Living a healthy lifestyle benefits everyone, no matter what shape or size you are. I have a thigh gap and I never knew it was a big deal. I like it and all but its my natural body shape, I'd never starve for it! So weird what people obsess over. It is wierd what people aim for, and so sadi when they starve themselves!